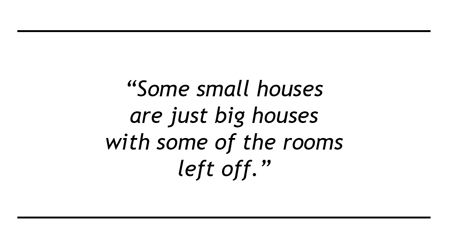 I’ve been talking the talk of downsizing, but last week, faced with the real thing, I panicked. We’ve been looking for a smaller house, even though we are not quite ready to move. Prices in St. Augustine are starting to go up, so we thought we’d check out what today’s dollar will buy. It’s been a fun process that raised lots of questions and got us thinking about just what we’re looking for. We’ve listed features of both houses and neighborhoods that appeal to us. At first, we were looking for houses under 1,400 square feet. That’s about the size of our downstairs. We thought it would work because we are shrinking our office space, which currently takes up most of our upstairs. One evening we were cruising one of our favorite areas and we spotted it – the loveliest of signs – “For Sale by Owner.” The house looked perfect for us. A quick call to the owner told us it was 1,200 sq ft. Within an hour we were inside, amazed by the great shape it was in, the huge woodsy yard and the closeness to my favorite bike route. Then we looked more closely. Every room was tiny. Very tiny. The bedroom would not hold our bed plus a dresser. The living room could not fit a full couch. The kitchen could not hold two people at once. And the place certainly would not store all my…stuff. That got me thinking: there are more variables at work here than the fact that I’m a pack rat. Yes, I am dutifully and desperately trying to walk my talk and pare down. My attachment to things is fighting back, but I am making slow progress. Why is it that I can’t come even close to the folks who I admire that are living truly tiny? First off, Irene was right. Not all tiny houses are created equal. 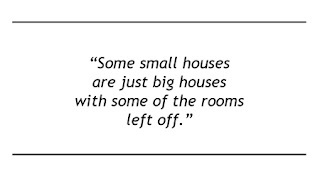 Some small houses are just big houses with some of the rooms left off. They are not designed to maximize space and give a feeling of living large. Ceilings are low. There is no storage. The layout isn’t flexible. The window placement is awkward. Take a house like that, gut it and built it back up like one of the smart tiny houses, and you’ve got more than enough space. That was out of the questions with the house we looked at. The inside was recently redone and the price reflected it. But right around the corner, someone just bought a 1,000 sq ft house for $39,000. It’s basically a shell, but it’s on a nice piece of land near the Intracoastal Waterway, with water and sewer in place. With some sweat equity, some cash and some careful planning, it could become a great space with plenty of room in a nice neighborhood. But why do I need 1,000 sq ft instead of, say, 500? 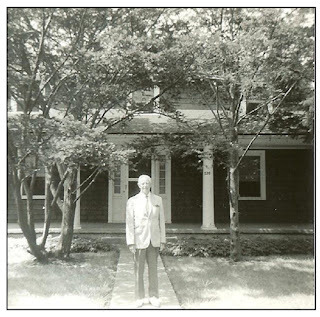 For me, the answer is that I do not have only my own stuff, but I am a caretaker for three generations of stuff. You’ve heard of the sandwich generation, caring for aging parents and young children at the same time? Well, I am a stuff sandwich. When my mom and dad died, as an only child I inherited all sorts of family furniture and memorabilia. My mother in turn had gotten a lot of it from her mom, and her mom from her mom, and back and back. It’s hard to get rid of that kind of stuff: The copy of The Secret Garden my mom read to me on the hill at Steppingstone Park overlooking Long Island Sound when I was five. My grandmother’s dining room table. My great-grandmother’s wedding dress. My great-great-aunt’s book of poetry. And that’s just the tip of the stuff-berg. Where would it all fit in a really tiny house? When I was 24, I told my new husband I didn’t want to buy a couch because it would tie us down. “I want everything I own to fit in the Datsun B-210,” I proclaimed. I forgot that back at my parents’ house was a shrine to my youth, right down to my NY Mets garbage can, my yearbooks and my Frye boots. And lots, lots more. My parents were the caretakers of my stuff back then, and soon I will be the caretaker of my daughter’s stuff. When she leaves for college, we will want a room for her to come back to, and she will hope that all the stuff she did not bring with her is still there. So for now, stuff is part of my life and it may be awhile before I can pare down to even 1,000 sq ft. 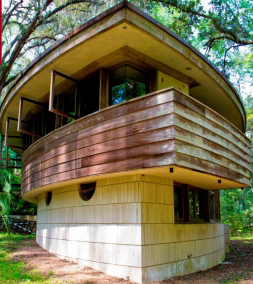 In the meantime, I would not say no to this Frank Lloyd Wright beauty, the only house designed and built by Wright in Florida.